Doug Nadvornick hosts the April 5, 2019 Inland Journal podcast. Today on the Inland Journal podcast, let’s agree to disagree. Have you ever said that to a friend or family member? You’re having a conversation about a news item you read about in the paper or heard on the radio and you just…don’t agree. But you want this person to stay involved in your life and so you jointly agree the relationship is more important than winning the argument you’re about to have. So, you agree to disagree. Well, that’s nice. Or maybe it’s really a cop out. Tracy Simmons and her Spokane Faith and Values, or Spokane FAVs, organization are sponsoring a public discussion about agreeing to disagree. “Spokane FAVs, every other month, we host an offline forum called Coffee Talks and we’ve been doing this now for almost seven years. It’s a way for people to come together and discuss, in the community, face-to-face, issues that are happening in the news, issues that surround faith and ethics,” Simmons said. 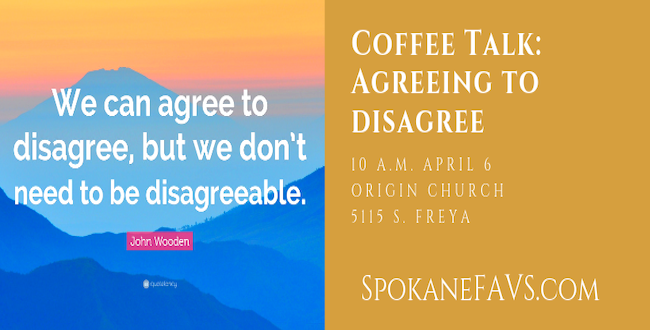 On Saturday, Spokane FAVs will host a coffee talk about agreeing to disagree. 10 am, at the Origin Church, 5115 South Freya. As a warmup, Tracy brought two of the five panelists for that discussion to our studio to talk about it. Neal Schindler is the director of Jewish Family Services in Spokane. He writes the Ask a Jew column for Spokane FAVs. Matthew Williams is a fellow at Spokane Faith and Values and a Gonzaga student who is studying math, physics and film. Find the Inland Journal podcast in iTunes, Google Play or NPR One or on the SPR website.